A lighthouse shines its all-seeing eye into the vast ocean, beaming a ray of light into the unknown to avert risk and protect from danger. 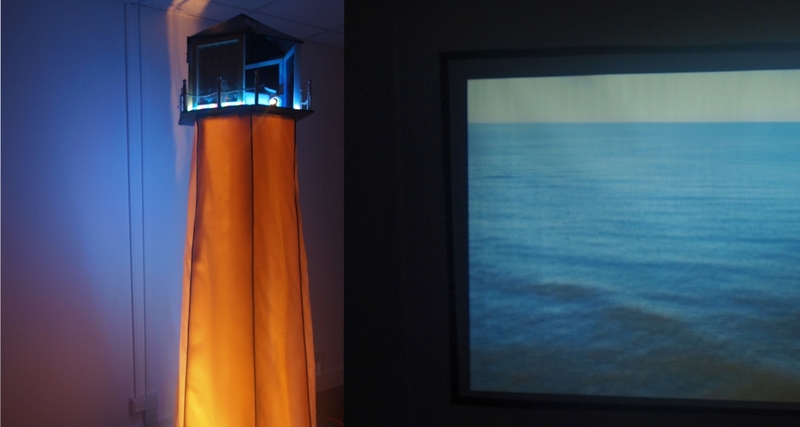 This audio-visual installation using sculpture and projection, film and sound explores the ocean as a symbol of unpredictability and the unknown in the context of mass data collection and its influence on predicting behaviour. Contemporary surveillance systems have shifted towards a model that creates a baseline to identify any deviations which may raise an alarm. As surveillance shapes behaviour, these vast indiscriminate data nets promote a culture of predictability, the narrative of which is relayed in the film. Other tropes include light to examine the quest for total visibility and control, whilst the soundtrack emphasises this shift towards a culture of predictability beginning with distorted samples and randomly generated rhythms transforming into beat-based music with a 4/4 emphasis and sharper, cleaner sounds. Using an overheard telephone conversation (featuring NSA trigger words in its banality) embedded in the sound and shots taken from a drone flown high above the coastline and ocean, the piece reflects on the vastness of the data being collected and the ominous presence of a system that records everything we say and do. Premiered at Coastival, 18-19 February 2017, in an empty shop unit in Scarborough. Created at The Auxiliary in Stockton.